In This Game, You Play As A Hero And Your Goal Is To Bring Back Flora[Your Girlfriend] By Killing Powerful Villian Creatua. You Follow The Journey To The Creature Island To Make Flora Free. 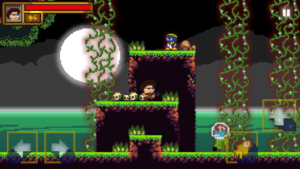 This Game Is Similar To Other Platformer Games But With Different Design And Obstacles. You Use Gun As A Weapon To Kill Monsters, Strange Creatures. Health Plays An Important Role, You Need To Protect Yourself From Enemies To Save Health. You Just Need To Avoid Them. There Are Lots Of Obstacles And Enemies Featured In This Game Like Cannons, Sharp Blades, Deadly Traps, Walking Eyes, Zombies, Flying Creatures And Much More. Difficulty Level In This Game Is High. But Initially, You Can Easily Clear Levels. This Is A Mini Platformer Shooting Game, Comes With 20+ Handicraft Levels, Pixel Art/8-Bit Graphics, And Simple Controls. But Sometimes Controls Does Not Respond And You Lose Your Health. Game Gets Some Hits When It Was On Sale[Black Friday Sale]. 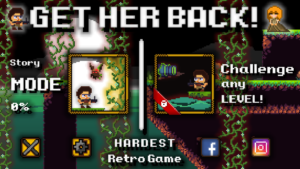 If You Love Platformer Shooting Game Then You Should Play This Or Go For Pixel Force 2[My Favorite Retro Shooting Game On Android]. Size – 15MB[Approx. ], Download – Here[Google Play Store].